So you’ve just received your new BBQ and your ready to start grilling and realize that you may need a couple of other items to enhance your grilling experience. Below we’ve listed a few of the most popular accessories that will help to make your cooking more enjoyable and keep your barbecue ship shape for many years to come. 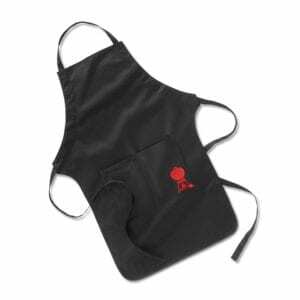 Whether it is having a grill cover to keep your BBQ clean and out of the elements, grill utensils that are specifically designed for using on a barbecue grill and other top BBQ accessories that will enhance you grill, we have these covered. No 11, I know I said Top 10 Best Barbeque Accessories but I just couldn’t leave this one out as I think it is a cracker and will be getting one shortly, more on that then. When you purchase a new BBQ grill you are going to be spending quite a few dollars and like any good investment, this one needs to be looked after as well. 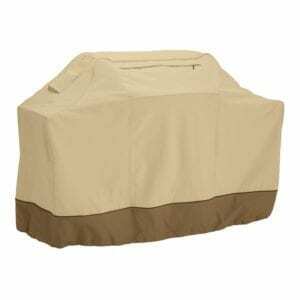 Apart from regular cleaning, a barbecue grill cover will quite possibly be the most affordable protection available for you new BBQ. Starting at around $20 you really can’t afford not to have one, even if your BBQ is stored out of the weather. With so many different styles of barbeques around there isn’t really a “1 size fits all” barbie cover. Check out the top selling barbeque grill covers on Amazon. Apart from the temperature gauge that is attached to most BBQ’s these days, a food or meat thermometer is the perfect companion when cooking your favourite roast in the barbecue. You can try and guess when things are cooked but using a grill thermometer you will know when they are ready to eat. 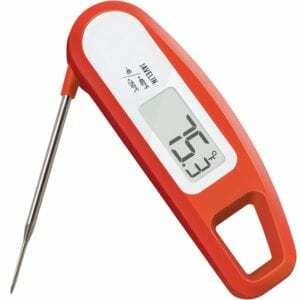 These days the digital meat thermometers are very affordable and extremely accurate. Take the Lavatools Javelin Digital Instant Read Food and Meat Thermometer for example, it is made from high quality food grade stainless steel, is accurate to within ±0.9°F and it is approved by the NSF for commercial use. 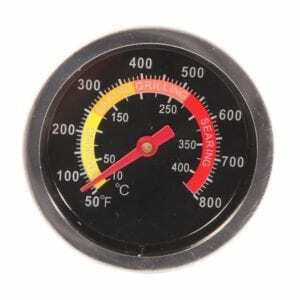 See what others say about this meat thermometer here. You will most certainly find that a normal pair of tongs is probably not quite good enough. The first thing you will notice is that they are not long enough and your hand will be heating up rather quickly so having a good pair of BBQ tongs is essential, match this with a good quality scraper, some heat proof gloves and your good to go. 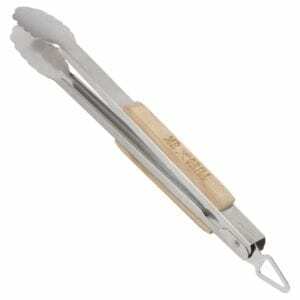 Having the right utensils at the start will make grilling more enjoyable and easy when cooking on your barbeque. They don’t cost the earth and you really will notice the difference. 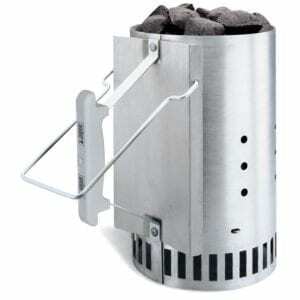 Probably the best invention ever for your charcoal grill is the charcoal chimney starter. This thing makes lighting the charcoal a breeze. The charcoal starter is fast and efficient and saves a lot of headaches trying to get your charcoal lit. The Weber 7416 Rapidfire Chimney Starter is a best seller on Amazon with well over 3500 positive reviews. It is lightweight, has a heatproof handle on the side, holds enough charcoal for a 22 1/2 inch kettle BBQ, and is cheap as chips at under $15. See what other users are saying here. Fancy yourself as a bit of a pizza maestro? Cooking a pizza in the BBQ, especially a charcoal barbecue, is the best way to impress your friends with your cooking prowess. 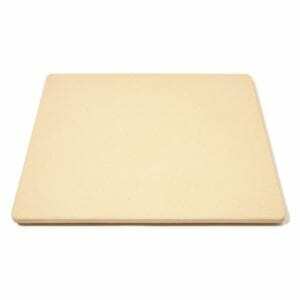 Using a pizza stone will provide a constant and even temperature to your pizza base making the perfect pizza every time. Become a Pizza cooking Maestro here. If your are like me the most common times for using the barbecue grill always seem to run into night time. Quite often starting out in the early afternoon but finishing in the dark, for some reason the lights on the back deck don’t seem to provide enough lighting over the BBQ. This is where an all weather portable grill light can help with the after dark cooking. One worth noting is the All-Weather LED BBQ Grill Light with Patented Universal Mount which has a Velcro attached mounting system that fits just about every barbeque grill out there. 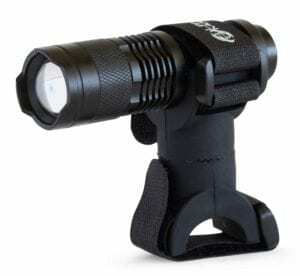 It is heat and weather proof, has adjustable swivel base and lens (wide and zoomed in) and comes with a LIFETIME warranty. Insane hey. Check out this fantastic grill light in more detail here. Now you’ve got your Barbie all sorted, what about you. You just know you’re going to get oil, fat or marinade splashed onto your clothes, you will, then don’t forget to protect your shirt and pants. Grab a BBQ apron, they can be plain and simple, have your favourite barbecuing extraordinaire phrases on them, right up to a complete mobile utensil rack that you wear (at least that what they seem). Go take a look at them, they start from under 10 bucks. The barbeque grill gauge, this term can actually be one of a couple of things. 1 – It can be a temperature gauge for your grill which is ideal to keep an eye on the internal temperature of your BBQ, and 2 – It can also be a gauge that attaches to your gas bottle to let you know when you are getting low on gas, nothing worse than running out half way through cooking your barbeque. Fortunately these gauges are very affordable and priced from around $10 to $15. See them here and read the reviews. Who hates cleaning their barbeque grill as much as I do? Well you should seriously think about adding the Qually United® – Must Have 18″ Best BBQ Grill Brush to you barbie tool kit. 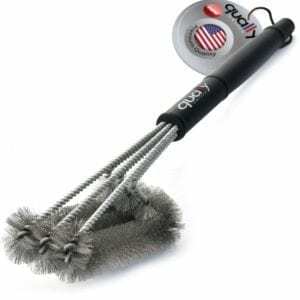 This brush has 3 woven stainless steel wire brush heads that will clean away the grease and grime up to 5 times faster than other grill brushes. It has a long 10 inch plastic handle to help keep the heat away from your hands and is a top seller with fantastic user reviews. Brush away your grease here. There’s nothing worse than the burning hand feeling when you have to turn a stack of snags on the barbie. After a short while your turning hand does get a little bit hot so why not keep your hands cool and comfortable with a pair of heat resistant gloves. The TTLife BBQ Grilling Cooking Gloves are an extremely high temperature rated (up to 932°F) pair of gloves. They are made from a combination of Nomex and Kevlar fibres which slow the effects of heat when handling hot items around the barbecue. 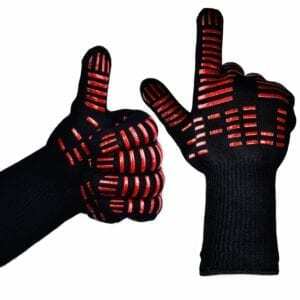 Find out what others say about these gloves. If you own a kettle charcoal BBQ grill then this could be the ultimate add-on. 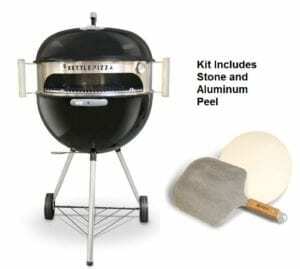 The Kettle BBQ Pizza Oven Kit. The kit is easy to install taking only a few minutes and no tools required. The kit is made from hi grade stainless steel and the design allows for pizza cooking without the need to keep opening the lid. You can get a basic kit which contains just the stainless steel sleeve with wooden handles, thermometer and aluminium pan, right up to the deluxe kit which contains the basics as well as a 15 inch cordierite pizza stone and an aluminium peel to safely remove the pizzas from the oven. Learn more and read the reviews here. So as you can see with just a few extra barbeque accessories in your kit, your outdoor cooking experience can be a whole lot more than just “snags on the barbie”. The other thing to remember is that they won’t cost the earth with most of the extra’s coming it at around or under $20 and they will last for many years, so what are you waiting for.